The depths of the world ocean are a giant melting pot. Look anywhere and you’ll find a bit of water from everywhere. How can seawater be from anywhere? Well, like French wine or potatoes from Idaho, seawater also incorporates important properties from its source. In the ocean, that point of origin is the sea surface. There, ocean waters interact with the atmosphere, land, and sun—becoming warmer or colder, and fresher or saltier. Currents sweep away waters from the surface into the ocean interior. They carry their acquired characteristics with them—and we oceanographers follow their scent. Just where they end up is important, because changes in temperature and salinity at the surface create ocean currents that affect our whole planet’s climate. It’s not an easy trail to follow, though. 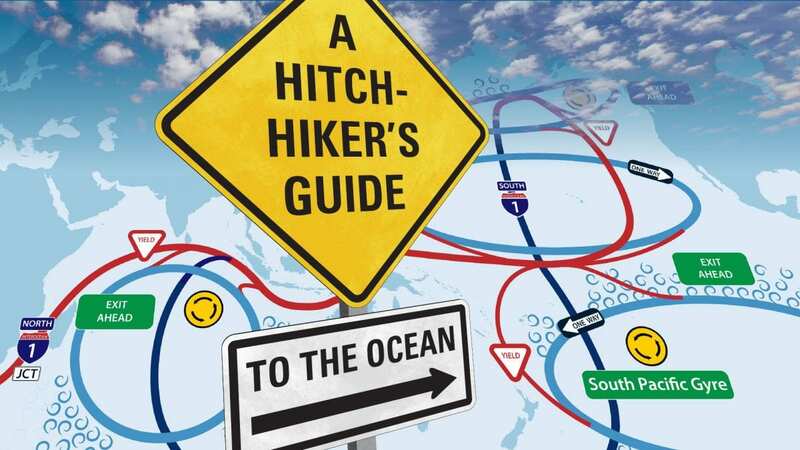 The ocean’s roads are as convoluted as an atlas of the United States—with the watery equivalents of interstate highways, big urban beltways, and small twisting back roads. Mapping this complex oceanic highway system and its traffic flow is fascinating. But it’s also critical to understand how it operates because of the cargo transported on it: heat. The ocean circulation system pumps warm tropical waters poleward, ventilating equatorial regions and tempering northern ones. Ocean currents are the main reason why Europe’s climate is so mild given its northerly latitude, for example. Today, Earth’s changing climate is leaving new imprints on the ocean surface, which, like a multi-car collision, could cause ocean circulation shifts that lead to further climate change. So mapping the roads traveled by these new surface waters, and their direction and speed, is key to predicting how our ocean and climate will respond. Let me show you around the ocean’s atlas. Perhaps the most noticeable features on our oceanic road map are the gigantic gyres circulating in each major basin. Prevailing winds, together with Earth’s rotation, whip water around the confines of the North and South Atlantic, the North and South Pacific, and the Indian Oceans. Similar gyres spin in the opposite direction in the far northern reaches of the Atlantic and Pacific, along with a sort of super-gyre completely encircling Antarctica. You can think of the gyres like big urban beltways—commuters zip around them every day, but usually end up back where they started. If we zoom in, we see that the gyres are also full of smaller swirling features called eddies. These eddies stir the ocean. So rather than tracing neat circles, individual water parcels twist around the gyres like a tangled mess of spaghetti, occasionally escaping across the gyre edges. Some water does flow predictably between the gyres, but it’s a slow process. 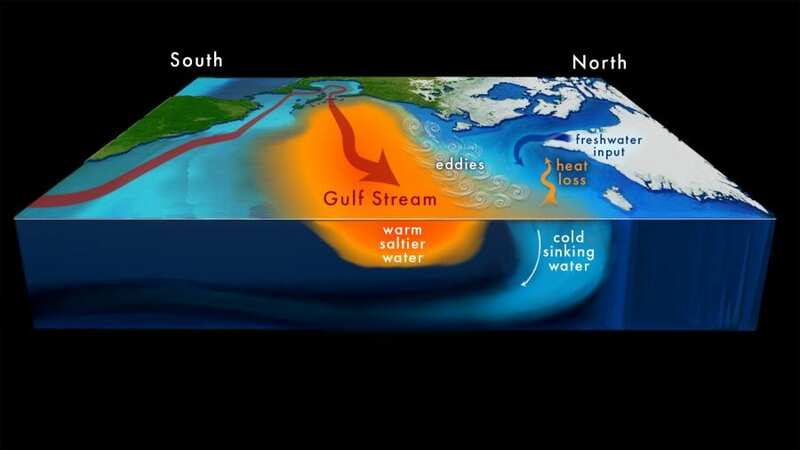 The gyres are connected by the ocean’s interstate system, often called the “Global Ocean Conveyor Belt.” At a key crossroads in the North Atlantic, warm salty Gulf Stream surface waters move northward, where they cool rapidly in winter, becoming denser. They sink to the depths, propelling deep currents that flow out of the North Atlantic and into other oceans spanning the globe. Warm tropical waters are drawn poleward to complete the loop. This loop, scientifically, is known as the Atlantic Meridional Overturning Circulation, or AMOC. If it slowed down, there would be repercussions for our climate. Less warm water and heat would be pumped to the North Atlantic region. Less cold water would sink to the deep ocean, bringing with it carbon that might otherwise return to the atmosphere in the form of heat-trapping carbon dioxide. The fate of the AMOC is uncertain. Scientists are still trying to pin down what might happen to it in a warming world and how any changes in the AMOC would, in turn, affect our climate. The possibility of an AMOC collapse—and ensuing catastrophic climate impacts—even inspired a sensational Hollywood film, The Day After Tomorrow. Surprisingly, scientists more often knock the flim’s absurd dialog than its questionable physics. 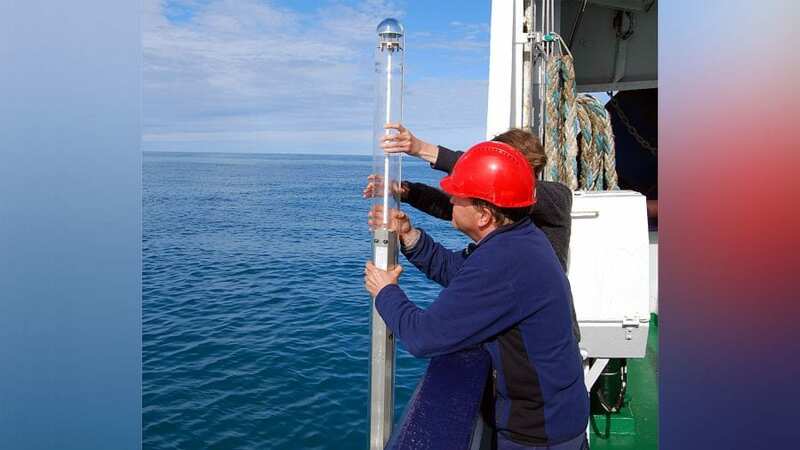 Analyzing evidence from ice sheets, ocean sediments, and other paleo-climate records, scientists have inferred that the strength of the AMOC has fluctuated dramatically in the past, going from full throttle to turning almost completely off within decades. These events match up with large global temperature swings that have occurred in Earth’s history, especially in the Northern Hemisphere. The evidence also suggests that the AMOC has slowed down when large amounts of fresh water enter the North Atlantic Ocean—something not unlike what we are seeing today. In today’s climate, the North Atlantic is getting warmer. Greenland glaciers are melting and rainfall is increasing, and that is sending more fresh water into the North Atlantic Ocean. Fresh water is less dense than salty water, and so it doesn’t sink as readily. That could lead to some slowdown of the AMOC and less heat transported to the North Atlantic. The climate impacts wouldn’t resemble anything like Hollywood’s doomsday scenario, but they would still be significant. Northern Europe, in particular, may not warm as much as the rest of the world. But a competing factor is brewing farther south in the Atlantic. Warmer air temperatures are spurring higher evaporation, sending water vapor into the atmosphere and leaving behind saltier—and denser—waters. If more salty waters flow northward, it would ramp up sinking in the North Atlantic. With the warming we see today, most climate models predict that the local effects of fresher, lighter surface waters beat out any mixing with heavy, saltier waters from the south. But more salty surface waters than we realized may be percolating up north. So tracking the spread of saltier waters as they make their way to high latitudes is key to predicting this tug-of-war between fresh and salty in the critical sinking region. Scientists have traditionally measured ocean currents, temperature, and salinity using ships or stationary buoys. These sample at a specific location or along a planned track—which is useful for studying a local region but not as good at revealing how waters connect over long distances. Drifting instruments were designed for this purpose. They flow along with a patch of water as it moves. The oceanographic community maintains a set of more than a thousand surface drifting buoys, which regularly communicate their data via satellites. However, true water pathways are three-dimensional, and designing a float to follow the flow across a range of depths is challenging and expensive. Below the ocean surface, the only practical means of communicating long range with floats and tracking their locations is using sound waves. This requires a sprawling installation of underwater loudspeakers and receivers. And not many instruments can survive the harsh environment of seawater for more than a few years without maintenance, while it may take decades for an actual water parcel to cross gyre boundaries. During the 20th century, humans unwittingly created a few ocean tracking experiments of their own. Two chemicals rarely found in nature—radioactive tritium from nuclear bomb tests and chlorofluorocarbons used as refrigerants—made their way from the atmosphere into the oceans. These pollutants were pumped into the air over a known period, so they had the effect of “tagging” any waters present at the surface at that time. Researchers have made use of these tracers by measuring how fast they spread from the surface into the ocean interior. The scientific insights about ocean circulation and mixing give a thin silver lining to these environmental blunders, which scientists hope will not be repeated. To surmount the limitations of traditional methods, a new approach may be in order. More and more, oceanographers are choosing to forgo observations of the real ocean altogether. Instead of releasing actual floats, we can dispatch synthetic ones—imaginary particles that follow the currents in state-of-the-art computer models that simulate ocean circulation. In the digital realm, millions of these drifters can be released to trace the pathways of seawater anywhere in the world. They will bob around in the flow for centuries without complaint, and the software can be run efficiently on a desktop computer. This deluge of data can be churned through quickly using “parallel computation,” in which many particle positions are calculated simultaneously by different parts of the computer’s processor. In fact, the most efficient hardware for running particle models are the graphics-processing chips typically used by video gamers and photo-editors when they render images with millions of pixels. These chips are very fast at performing many simple calculations at once. Ocean models have improved in recent years to the point where they replicate most of the important components of the circulation, even the small eddies that work to stir together adjacent waters. This makes particle pathways in today’s models look much more like those measured by drifters in the real ocean. I am part of a group of researchers at Woods Hole Oceanographic Institution and the Massachusetts Institute of Technology who are using virtual floats to try and understand the sensitivity of the AMOC to changing surface waters. By releasing floats in multiple ocean models, each with different abilities to simulate eddies seen in the real ocean, we find that these features speed up the transport of salty water northward. By providing some stirring at the margins of gyres, the eddies give a little extra push across the gyre boundaries. More filaments of salty water make their way into the North Atlantic sinking region, balancing out the influx of fresher water entering the ocean. This means that in models without strong eddies, the slowdown of the AMOC is probably overestimated, and the system is more stable to a warming planet than scientists previously thought. 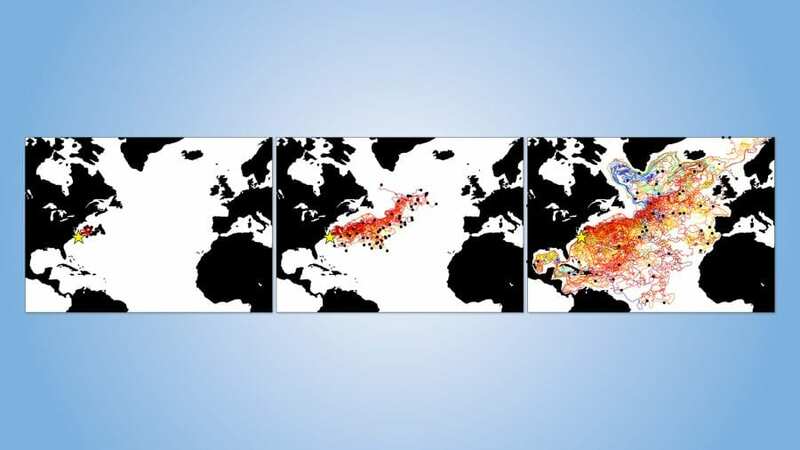 Numerical ocean models have produced many novel discoveries about the workings of the climate system, allowing for a sandbox-like environment in which scientists can tweak variables to tease out cause and effect. As computing power continues to grow, models are improved by recreating smaller and smaller features within the ocean’s flow. Still, despite the increased detail in today’s models, the value of sustained measurements taken in the real ocean cannot be overstated. Without a way to ground-truth the models with actual observations, they may lead us astray. Together, these different sources of information complement one another to fill in our gaps of understanding. Detecting signs of climate change in the real ocean is much easier if we have some idea of where to look, informed by theory and models. For scientists to continue producing useful forecasts and insights in a changing climate, we must utilize all the technical pathways available to us. This synergistic use of many techniques and approaches often produces true breakthroughs in oceanography and is a large part of what makes it a fascinating field. This research was supported by a NASA Earth and Space Science Fellowship and the J. Steward Johnson Fund. A schematic “roadmap” of the ocean’s circulation: Each ocean basin contains large spinning gyres, driven by Earth’s rotation and winds. The gyres are mostly self-contained, so that waters circulate within them rather than flowing between them. Small swirling eddies, which can be found everywhere in the ocean, provide some stirring between the gyres. 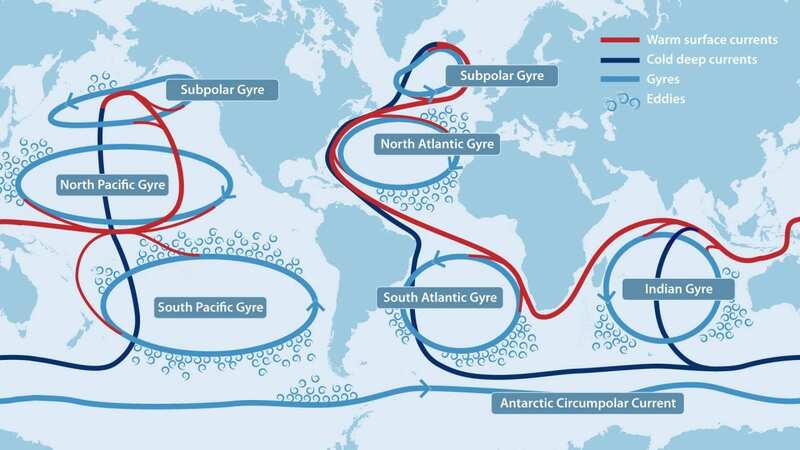 A global circulation known as the “Ocean Conveyor Belt” also provides a connection between the gyres, propelling warm surface waters and deep cold waters around the world. “Synthetic” floats are used to generate trajectories in computer simulations of ocean circulation. Here, a group of floats are released near Cape Hatteras, with the three panels showing float locations after one month, one year, and ten years. The complexity of the ocean’s currents causes these floats to rapidly spread apart, and the details of this spreading are important to predict the ocean’s response to climate change. Colors indicate the depth of the floats, with red trajectories near the surface and blue ones in deeper waters.